(1936, Grand National) George Houston, Marian Nixon,Movita, Vince Barnett, Roy D'Arcy. IN GLORIOUS COLOR! 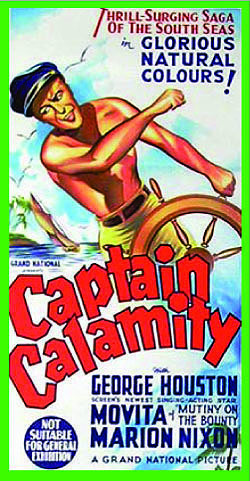 Houston is vibrant in the title role of Captain Calamity, a south seas skipper who single-handedly fends off a host of island thieves and cut-throats who are after a lost treasure. Fairly violent for a mid-thirties indie. From Grand National. Color, 35mm nitrate.